If the first year of the Iraq War of 2003 offers up some clues to the potential move in the silver price (NYSEARCA:SLV) following an invasion of its neighbor Iran, then grab as much of the white metal as you can and enjoy the ride. This ride could be for the record books. On the official day of the U.S. invasion of Iraq on Mar. 20, 2003, silver traded at the lowly price of approximately $4.35. On the first anniversary of the invasion, the silver price (NYSEARCA:PSLV) reached nearly $8.00, for an 83 percent return (see graph, below). But an attack on Iran could make an 83 percent return seem minuscule. Backing up for a moment, however, an obviously important question, first, should be: how likely is an imminent attack on Iran? With reports of American troop movements into Israel, along with Reuters reports of two U.S. aircraft carriers headed to the Persian Gulf and a lot of chatter from Washington command appearing on television as salesmen for an attack, a military strike on Iran is likely, according to Jim Rickards, adviser to government personnel on U.S. national security issues and frequent guest of King World News. And following Iran’s announcement that it will no longer accept U.S. dollars for Iranian oil, the U.S., really, must respond (1). If not, OPEC gets the green light to dump the dollar and it’s game over for the U.S. without a shot being fired. Consider, too, recent data from the Fed, which show clearly that foreigners aren’t buying enough Treasuries to even remotely match the increase to the central bank’s balance sheet. In fact, according to the chart, below, a war with Iran is a most likely stab at coaxing global money back into preventing a waterfall in the dollar after bond vigilantes are done with Europe. 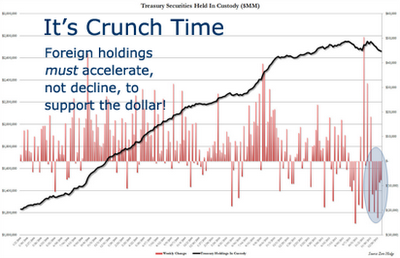 Source: zerohedge.com, Foreigners Sell Record $85 Billion In Treasury’s In 6 Consecutive Weeks – Time To Get Concerned? 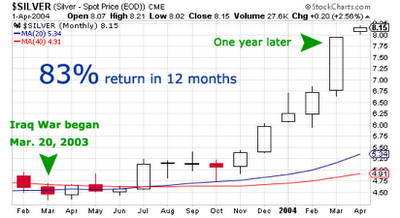 But here’s why the silver price could triple, or more! The difference between the Iraq War and a war with Iran is: Iran isn’t Iraq! Saddam Hussein’s regime had no friends in the region, and certainly didn’t attract meaningful help from Russia or China before, or during, the conflict. Hussein was essentially a rogue operator, according to William Clark, author of Petrodollar Warfare: Oil, Iraq, and the Future of the Dollar, which, by the way, offers a good foundation to Jim Rickard’s book, Currency Wars: The Making of the Next Global Crisis. Because of the well-known and long-standing commitment from Russia and China to defend Iran, a war with Iran could turn into a proxy for WWIII, a notion widely offered in the public domain. In other words, if Iran is attacked, the move in the silver price (NYSEARCA:AGQ) could be monstrous—with two and three-bagger returns very likely, with oil and other commodities soaring to unthinkable levels as China utilizes one of its financial weapons in response to military aggression. The cost of a war with Iran will soar off the charts to an already hopeless U.S. debt level. In fact, a planned dollar devaluation could be the motive behind an Iranian attack. According to a policy paper penned by Felix K. Chang and Jonathan Goldman for the U.S. Army and posted on the U.S. Army Web site, titled Meddling in the Markets: Foreign Manipulation, the threat by China, Russia and sympathetic nations against U.S. aggression, a war with Iran will not be a cakewalk by any stretch of the imagination. Link to document file, here. According to Chang and Goldman, Iran puts at risk the U.S. dollar in a very meaningful way. While many of traditional media may repeat the mantra that precious metals are risky investments, the facts about war and money show otherwise. At risk here is the dollar. The unprovoked “shock and awe” attack on Iraq was to serve several economic purposes: (1) Safeguard the U.S. economy by re-denominating Iraqi oil in U.S. dollars, instead of the euro, to try to lock the world back into dollar oil trading so the U.S. would remain the dominant world power-militarily and economically. (2) Send a clear message to other oil producers as to what will happen to them if they abandon the dollar matrix. (3) Place the second largest oil reserve under direct U.S. control. (4) Create a subject state where the U.S. can maintain a huge force to dominate the Middle East and its oil. (5) Create a severe setback to the European Union and its euro, the only trading block and currency strong enough to attack U.S. dominance of the world through trade. (6) Free its forces (ultimately) so that it can begin operations against those countries that are trying to disengage themselves from U.S. dollar imperialism-such as Venezuela, where the U.S. has supported the attempted overthrow of a democratic government by a junta more friendly to U. S. business/oil interests. Eric Sprott: "Who is not Getting the Silver?"